Clearly, this was just a first-stage brainstorm. It hit a lot that matters to me, though, so bonus. I wanted to include and celebrate all aspects of my daily living—looking forward was also key, as it would provide direction for the coming year(s). What I forget was what I most often forget: rest. Some form of this conversation periodically repeats itself within my life: some friends remind me of it frequently while others only mention it once in a while. Over the years, I’ve continued to filter out the “busy for the sake of busy” from my life; what I’ve been less successful with (yet still improved!) is culling my personal interests. In college, I graduated with 3 majors, a minor, over 170 credits, numerous activities/organizational involvement, and an active social life. Nearly 10 years later, I have fewer commitments and am more deliberate about saying “yes” to people, activities, organizations. 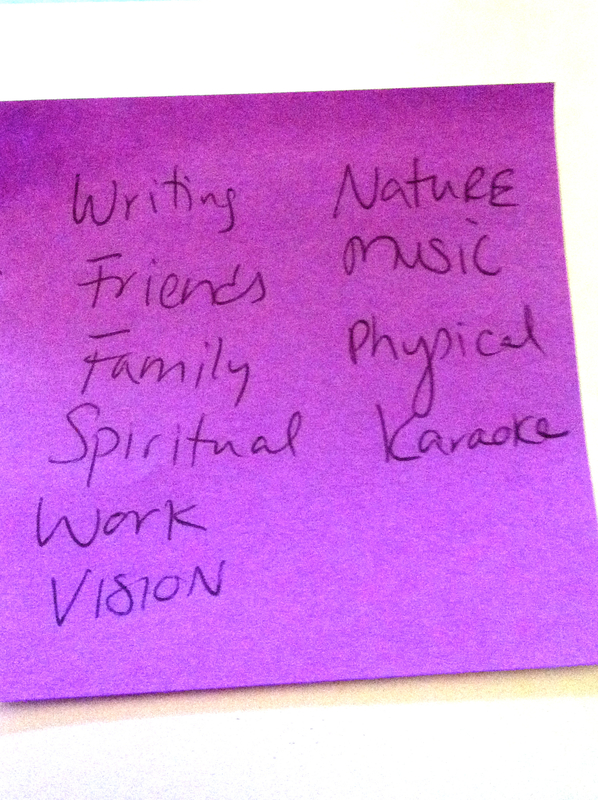 My 30 days of 30 post-it reflects the balance I still seek (and practice) in this area. Yesterday, then, I chose to celebrate my 30 days of 30 by doing absolutely nothing. I canceled my scheduled events (trip to Spa World and night out with a friend) and chose instead to stay home and recharge. I wrote, read, had a solo dance party, and overall lounged. I talked on the phone with 3 friends. I planned out a bit more for my yearlong project that will launch July 1. I looked at a friend’s work and sent some feedback. My shower and I had a nice long date. I also beat a level of Candy Crush Saga (don’t succumb to it, it will ruin your life) that I’ve been stuck on for 6 days. It was a perfect day for the arrival of a Tropical Storm (Andrea), plus, I got to recharge so that I can live it up over the next few days. How do you make sure that you recharge? If you’re so inclined, comment! I’m always looking for new ways to step back and breathe.